It was a very gratifying weekend. We had spent months dithering about the front entrance door. 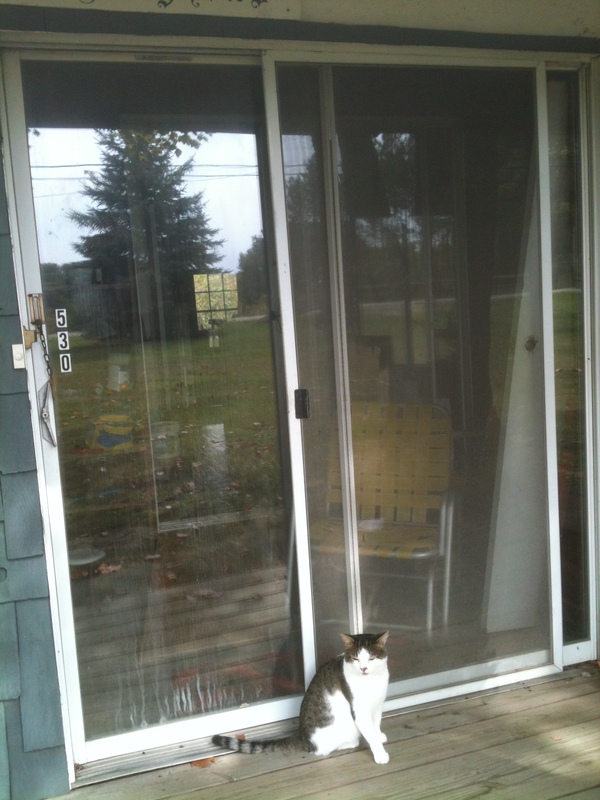 There is one good point to sliding glass doors and that is: glass. They let in light. This is a very good attribute if the room is dark and has only one other window. We didn’t want to lose the light; and there were 4 (four!) giant panels of glass to turn into real doors. A door such as this would be lovely. Yes? This door is on clearance from Door Emporium; the clearance price is $1995 plus shipping of $150. 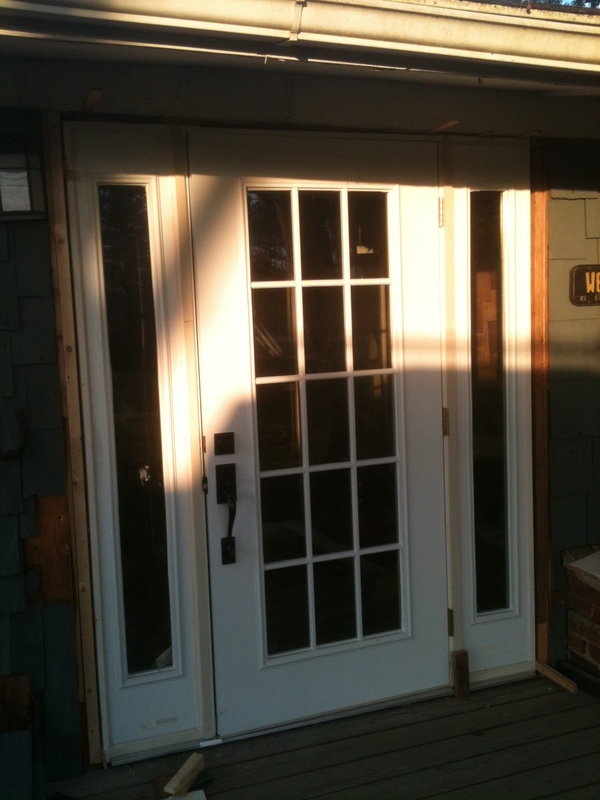 Entry doors tell the story of your house in ten words or less. Grand or simple, painted or wood, leaded glass or rough hewn, windowless or all glass, they are the topic sentence in Chapter One. Everyone who comes into your house goes through those doors, and most will form an opinion of their character as they walk through. Are they ostentatious (Faulkner) or humble (Emily Dickinson)? Do they have style (T.S. Eliot)? Can you see through into the bright, cheery house (Alcott), or is the door stark and unfriendly (Poe)? I wanted a good, old-fashioned, Wendell Berry kind of door. 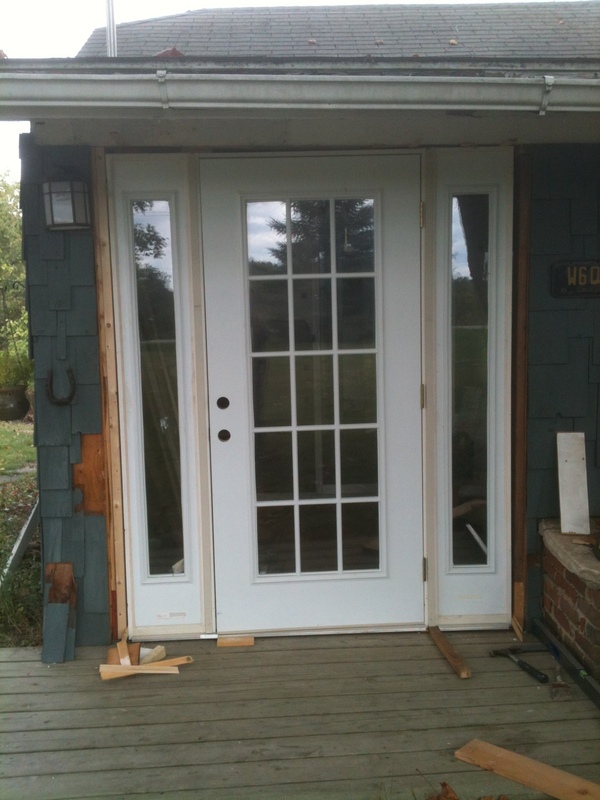 But those old farmhouse doors don’t let in much light, plus we had a six-foot doorway to fill. I kept finding all these lovely old doors at the Restore places, and Michael kept telling me they were interior doors. “But can’t we use them as exterior doors?? ?” I would ask. The short answer was No. Michael’s concern was for the seal. Keep out winter. Keep out water. Keep out critters. But before he sent me the picture, he told me the price: $189 + tax. Free delivery. (That would be us wearing delivery hats.) So, I can compromise. It is a metal door; but it has lots of windows and not so much metal. And it can be painted. Sold. Yep, free delivery. Did I mention heavy? The sun was beginning to set by the time the lock and handles were in place. We were delighted just to be able to turn the knob (the knob is on the inside) and open the door! And when we left on Monday, we locked the door just as if we lived in a real house. Those Price is Right contestants don’t have any thing on us — such excitement behind Door # 1! We were so excited on Sunday night that we ripped out the other sliding glass door that goes into the kitchen as well. Post Script: As I was publishing this post, my wonderful husband came back from Home Depot with perfect matching trim for adding horizontal muntins to the plain sidelights of the door. Add $5 to the cost of the door; but the new look of it? Priceless! looks great! what color will it be? . . . I feel another post on its way . . . 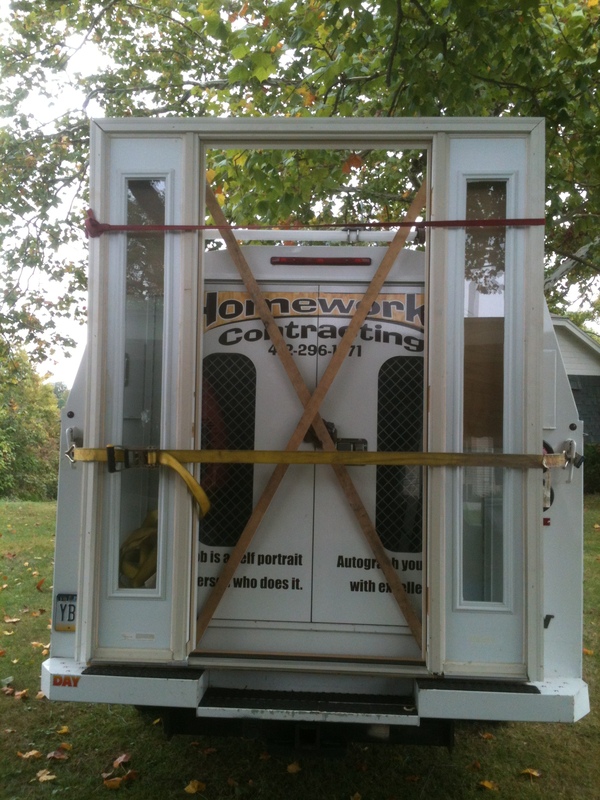 In order to decide on the color of the door, we would have to know what color the outside and the trim will be painted. Ha! Not even close… It will stay primered white for awhile. I like the door handle. The door looks great. I love the kitchen ceiling with the lights. I’ve always been partial to that wainscoting look. Nice work! You’re normally so good at explaining everything in layman’s terms, but… “horizontal muntins to the plain sidelights of the door.” WHAT!? Hahaha. Doorspeak has gotten to me! Muntins are the little crisscrosses that divide the panes. The sidelights are the long glass panes on either side. See how they are plain (sans muntins). 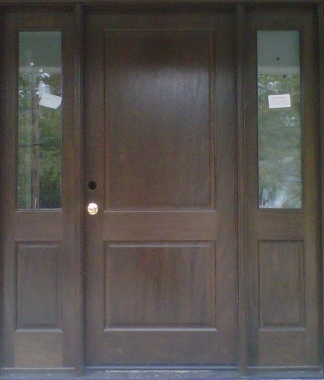 That was the main thing I didn’t like about the door–it looked like the side panes didn’t match the door because they were missing; Michael got long pieces of molding that match exactly, so now we can add them to make the sidelights match the door. Should I revise? Like the eyebrows to a face your door looks fabulous. Keep up the good work. Nice! Love the light and the door hardware. I bet it was as much as the door!? Um… Not quite. $140 at the Depot. I say you have to know when to go with the big box stores and when to hold out for something else. Maybe cheaper — maybe pricier. But in this case, we liked it, price wasn’t bad, and it was available now.